PlaymoTV is one of the oldest SmartDNS service providers out there. Launched in 2011, the service opens up access to leading On-Demand services on the web. This review article will throw a light on the features offered by the service as well as let you know whether the service is worth using. Server Locations & Site Access – PlaymoTV can unblock American, British and European On-Demand services like BBC iPlayer, HBO Now, Netflix, Crackle, Lifetime, Hulu, iTunes Videos, PBS, iTV Player, Showtime, Sling TV, Crunchyroll, CWTV, Yahoo Screen, History Channel, Comedy Central, A&E TV, HBO Nordic, ABC, NBC, CBS and Amazon Prime. Additionally, the service includes a Netflix Switcher component which allows you stream local versions of Netflix US, UK, Germany, Sweden, Canada, Australia, France and Brazil irrespective of your current location. VPN Speed & Bandwidth – PlaymoTV allows you to stream On-Demand content at incredibly fast speeds. Since the provider doesn’t route your entire traffic through its servers, there is almost zero speed loss. What’s more, the service doesn’t make use of complicated encryption or algorithms meaning your streaming remains free from speed loss and buffering. Privacy Settings – PlaymoTV is one of the very few SmartDNS service providers which allows you to login with your Facebook account. While the provider does collect aggregate usage information from its subscribers, it knows the importance of keeping the information safe and private. The company does not rent, sell or share the personal information of its subscribers with third parties. However, the company will comply with all the legal requests and may even hand over the personal information of subscribers if an illegal activity is committed via its infrastructure. Supported Operating Systems – PlaymoTV is compatible with Windows XP, Windows Vista, Windows 7, Windows 8, Mac OS X, PlayStation 3, Apple TV, PlayStation 4, iPhones, iPads, Xbox 360, Android, Xbox One, Amazon Fire TV, Fire TV Stick as well as routers manufactured by Asus, D-Link, DD-WRT, Netgear and Linksys. The service even works on Samsung Smart TVs, Boxee Box, Roku and Nintendo Wii but currently these devices are supported on an experimental basis. The company offers its own software for Window and Mac (known as Windows linker and Mac OS X Linker) as well as an app for mobile devices. For other systems, the company has published detailed setup instructions which would help you to configure the service manually. Customer Support – PlaymoTV offers support through a ticketing system. Additionally, there is a detailed FAQ and Knowledgebase section published on the company’s website which can help you to troubleshoot technical problems on your own. Pricing Options – PlaymoTV’s SmartDNS service costs $4.99 a month, 13.99 for 3 months, $25.99 for 6 months and $49.95 for a year. It is possible to try the service for free for a period of 7 days (no credit card is required) plus there is also a 14 day money back guarantee available. Final Verdict – PlaymoTV certainly delivers an impressive service. The service is fast, reliable and it even includes a Netflix Switcher feature which is not available from many service providers. 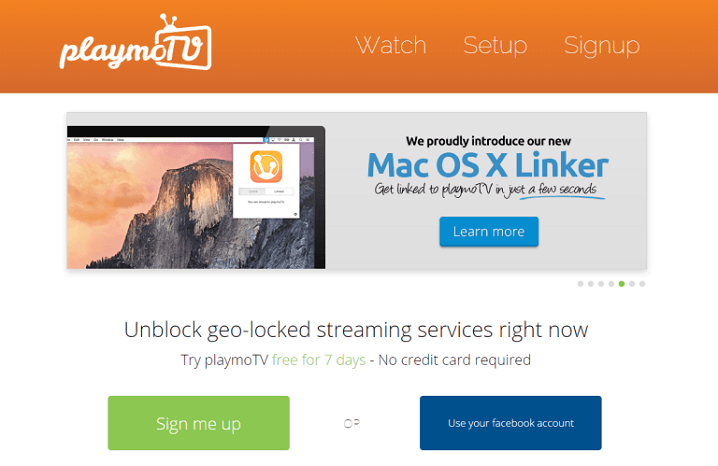 So if you are looking for an easy way to unblock your favorite streaming services online, test drive PlaymoTV today. For more information, please visit: www.playmo.tv.